The Post Where I Say Nice Things About Harpoon…A Quad Review. The Harpoon Brewery of Boston is preparing for the release of a new line of ‘big beers’ to accompany its existing line of mainstream ales. The new series, named ‘Leviathan,’ will start out with draft only offerings and eventually transition into 4-packs and limited availability on draft. The line is designed to appeal to the niche of beer geeks who felt that the brewery’s ‘100 Barrel Series’ lacked sufficient punch as a specialty release. The 100 Barrel Series was initially designed to help Harpoon push beyond its stock lineup of traditional, mild flavored beers. 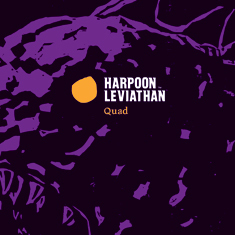 While it offered several ‘extreme’ or higher gravity offerings, the 100 Barrel Series eventually focused on more traditional styles, such as oatmeal stout and wit, that were not designed to push the brewing envelope, the Leviathan series is expected to forage into new brewing areas for Harpoon. The Quad style bears a moment of mention, not so much for what it is but perhaps for what it is not. If not a creation of American craft brewers than at least a rebranding, the quadruple/quadrupel style has a pretty sketchy history, even compared to other styles about which it turns out we know very little. Up until a few years ago, beer lovers used to call quadrupel-style beers either trappist ales, trappist-style ales, or abt-style. There was inevitably a bit of friction with the seven, then six, now seven again European trappist breweries. So a name change was required to describe this strong, malty, phenolic beer. [F]ermented with a blend of two traditional Trappist yeasts. A mixture of two-row pale malts, caramel malts, and special aromatic malts gives the Quad its richness and texture. The subtle hop flavor imparted from Brewer’s Gold hops lingers in the background and provides just enough bitterness to balance the malt sweetness. The addition of imported Belgian Dark Candi Syrup rounds out the beer, giving the Quad its full body and deep auburn color. Expect notes of honeyed dry fruit with peppery phenols in the aroma, a velvet-like mouthfeel, and a superbly drinkable beer…Original gravity 26.2, ABV 11.75%, 44 IBU’s. So let’s get to the beer. I bought a 4-pack of the brand for about $10 at a local package store, stored cool. Pours with a slightly murky/hazy purplish rouge color, mild but active carbonation. Aroma is very complex and playful, with immediate notes of the classic Trappist yeast strain, big deep sweet malts, and numerous fruits and phenols, from banana to bubble gum. A real pleasure just to smell. There is the slightest hint of a peppery spiciness deep in the beer but is pretty overwhelmed by a substantial but not overbearing alcohol note. The alcohol is not hot in the aroma but adds a pleasant warmth. Mouthfeel is medium to heavy and easily coats the entire mouth with malt sweetness, with some carbonation bites rounding out the edges. As it warms, I’m noticing some slightly sour notes in the aroma. Flavor waits for a second and then explodes in all directions, unleashing a torrent of banana and fruity tones, then a splash of European malt sweetness, followed by that previously hidden black pepper spiciness, and then ends with a surprisingly bitter finish mixed with big alcohol notes. With these descriptions, such a beer could easily devolve into a completely undrinkable mess. The Harpoon Quad doesn’t; instead it just shows you sharp glimpses of each before retracting into a balanced finish. While all of these notes mellow as the beer warms (and it sweetens considerably), I think the Harpoon Quad is still a pretty young beer. I’m going to lay down my remaining bottles for a few months and check on their quality. I would imagine that the beer could easily lay down for a few years. And considering that I had a nearly five-year-old bottle of Harpoon’s Barleywine (Release Four of the 100 Barrel Series) that aged beautifully, it’s a pretty safe bet. The next beer in the Leviathan series, a huge Bohemian Pilsner, will be out in a couple of months. Using German pilsner malt and Saaz hops, the beer will clock in at 10-percent. I’m generally not a fan of imperializing classic German styles but look forward to trying the next release after the solid to excellent Leviathan releases I’ve had to date. You forgot to mention that they did just recently add to their regular offerings. The Leviathan Imperial IPA is now a regular offering, and a good one at that. It’s quite possibly going to become my “go to” DIPA (if you can call a DIPA your go to beer). I’m not a huge fan of quads, but I enjoyed the Harpoon one quite a bit (much better than the “quad” recently released by their competitor to the north). That being said, I, too, don’t understand why there is no official style for quads. Most of them are similar enough to warrant its own style and different enough from Strong Dark Ales, which tend to trade some of the dark fruit flavors of quads in favor of more spice flavors (at least in my experience). I haven’t heard that the DIPA will be a regular offering or just one that is brewed again at some point in the future. In either event, it’s welcomed news. But my point remains the same, I’d like to see some lower-alcohol, more traditional offerings with a greater flavor punch than the present portfolio offers. That’s just one person’s view, however, as all kinds of folks enjoy the present offerings. And I agree with your quad to the North comment, surprisingly enough. Good on Harpoon.